The world around us is changing rapidly. Culture, politics, trends, demographics, technology are all factors in shaping the new American consumer. The LGBT segment has moved from marginalized to coveted and the need for brands to understand and reflect the new landscape is stronger than ever. As the only diverse segment that crosses all ethnic, gender and socioeconomic lines, a strategic approach to the market is key. Since 2004, New Avenue has been the trusted partner of companies bringing insights and action needed to maximize the opportunity in the LGBT and allied market with a full 360° approach. National Gay & Lesbian Chamber of Commerce. We have a deep understanding of the LGBT community, our history, our struggles and our successes, all of which impact reaction to brands and help form purchase decisions. We are connected with the influencers and organizations that are integral to the ethos of the LGBT experience. We know that the LGBT segment is not monolithic. It is as diverse as the American population and intersects with every ethnic and socioeconomic group. We know that as LGBT people, our family, friends and colleagues (our allies) pay attention to how we are treated and to which brands are inclusive. Their active presence in the segment multiplies it's impact and spending power. We have our thumb on the pulse of the rapidly changing legal, political and cultural landscape allowing us to help brands navigate the space, avoiding missteps while maximizing impact. Since 2014, New Avenue has been retained by Hilton Worldwide to provide strategic counsel as LGBT subject matter experts across their entire portfolio of brands. Our work has included both internal and external communications, response recommendations to LGBT issues, competitive analysis, ERG consulting and the development and activation of ongoing multi-brand consumer platforms both on and off line. In addition, New Avenue is tasked with identifying, negotiating and overseeing the activation of unique event and sponsorship opportunities such as NYC and Capital Pride and others in an effort to elevate their leading market position. New Avenue has had the pleasure of working with Comcast to provide strategic direction and insight with the LGBT segment. Areas of focus have included expanding their digital footprint with Xfinity.com/LGBT, consulting on public relations across related topics, ongoing audit of their LGBT non-profit partnerships for maximum impact, and most recently, the creation and execution of Xfinity’s multi-city LGBT Pride initiative that brought a bit of Hollywood and the incredible LGBT centric content to the community. For two years New Avenue was retained by Kellogg's to provide ongoing consulting services to better understand and connect with the LGBT consumer segment. In 2016, New Avenue negotiated and helped direct Kellogg's first ever sponsorship of GLAAD's Spirit Day. What began as a modest initial effort quickly grew into a first-ever cross-company symphony of fifteen brands all "going purple" to support the anti-bullying campaign. 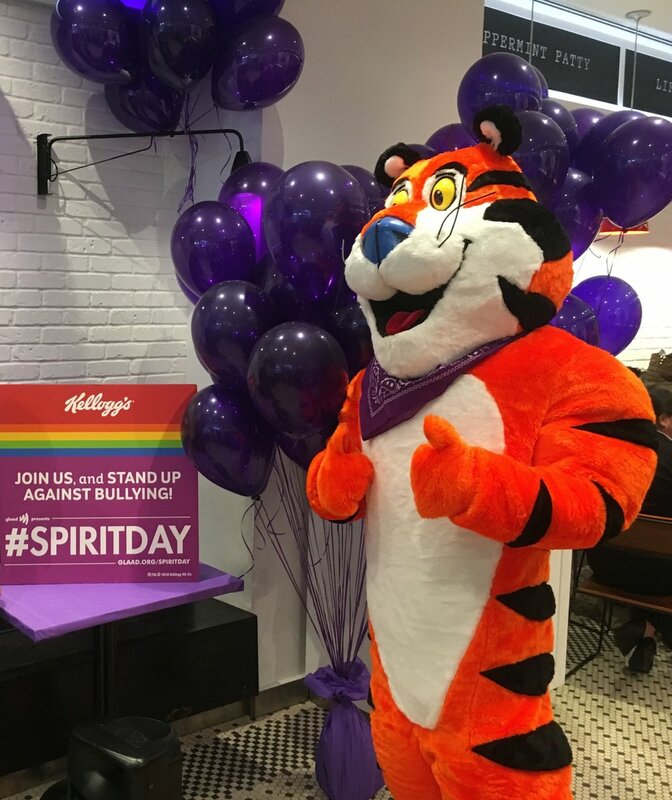 With a "Start your Spirit Day with Kellogg's" message, the activation included a live streamed breakfast event from the Kellogg's Cafe in NYC and continued with each of the participating brands posting creative memes in support. New Avenue led the charge in coordinating the cross-brand effort reaching thousands of people across the country. Joe Keenan is an industry leader with over twenty years in marketing for blue-chip brands and key non-profit organizations with areas of expertise in marketing/public relations communications strategy and consulting, strategic integrated marketing, experiential marketing, event planning, the LGBT segment and non-profit consulting/marketing. Keenan earned a degree in Theatre Management from the University of Minnesota and started his career in hospitality marketing. After swapping the Minnesota winters for California palm trees, Joe joined the agency world at Event Management and Promotions and quickly became the Director of Business Development. Over the next several years, Joe held senior business development positions with Momentum Worldwide, Gigunda Group and GMR Marketing building and executing successful campaigns for a number of leading Fortune 500 companies including General Mills, TiVo, General Motors, Target, Mervyn’s, and Guinness. In 2004, Joe created New Avenue Marketing to better direct his energy and more efficiently serve his clients and community. New Avenue Marketing is a full-service marketing and strategic communications firm changing the connection between brands and their target markets. In addition to the clients listed on this site, in 2009, Keenan created Green with Pride as an “event within an event” to showcase green products and services within pride festivals. From 2014 to 2016, Keenan helped establish and grow the national LGBT/Multicultural practice for MWW PR, holding the dual role as MWW Vice President and President of New Avenue. While working with MWW PR, Keenan was a driving force on clients such as Amazon Studio’s Transparent, LOGO TV, The Danish Girl for Focus Features and others. New Avenue is a Certified LGBT Business Enterprise through the NGLCC and has been included in Event Marketer Magazines “it” List of the top 100 agencies three times. Outside of New Avenue, Joe plays an active role in several community organizations and served eight years on the board of Outfest, home of the nations most prestigious LGBT film festival, with two as co-president. He has been a featured presenter at several conferences and workshops throughout the country and currently lives with his husband in Los Angeles. Now is the time for brands, big and small, to seize the opportunity. Drop us a line. We'd love to talk more.